The musical tradition of Ma'luf is believed to have come to North Africa with Muslim and Jewish refugees escaping the Christian reconquista of Spain between the tenth and seventeenth centuries. Although this Arab Andalusian music tradition has been studied in other parts of the region, until now, the Libyan version has not received Western scholarly attention. 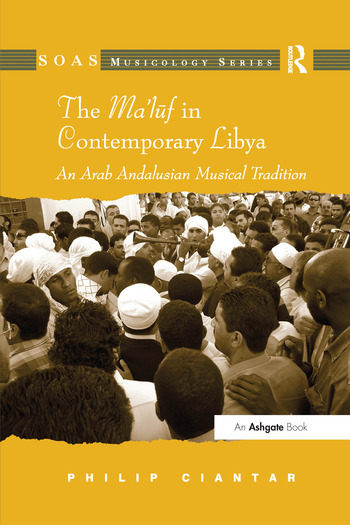 This book investigates the place of this orally-transmitted music tradition in contemporary Libyan life and culture. It investigates the people that make it and the institutions that nurture it as much as the tradition itself. Patronage, music making, discourse both about life and music, history, and ideology all unite in a music tradition which looks innocent from the outside but appears quite intriguing and intricate the more one explores it. Contents: Preface; Libya: society, culture and music; The Nawba in North Africa and in Libya; The Ma’lufal-ldha’a: change, continuity and contemporary practices; The musical making of Ma’luf; The Libyan Ma’luf in the realm of Arab music aesthetics; Epilogue; Glossary; Bibliography; Index. Philip Ciantar is Lecturer in music at the Music Department of the School of Performing Arts, University of Malta. He teaches courses in ethnomusicology, World Music, oral music traditions of the Mediterranean, semiotics of music and harmony. He contributed with entries on Maltese traditional music to the New Grove Dictionary of Music and Musicians and on Malta and Libya for the Continuum Encyclopedia of Popular Music of the World. His current research interests include Maltese popular music, North African music, Libyan music, learning styles of the world’s musicians and World Music analysis. In addition to his work in ethnomusicology he is also active as a composer.